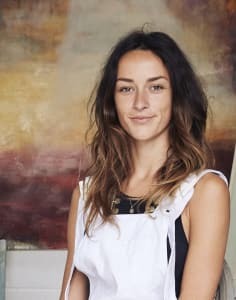 Georgie is an abstract landscape/seascape painter working from her studio on Stepney City Farm in East London. She has been teaching art classes for years, from home in Suffolk, then from Stoke Newington Old Church and at Artbox charity in London. Since moving to the city farm she has held landscape painting classes and 'Paint with Georgie' Saturday classes from her studio. The set-up is ideal, with glass double doors looking out onto the farm, animals all around, and neighboured by a spoon-carver and a ceramicist. It's a wholesome and creative environment, physically close but atmospherically very far from the hustle and bustle of the city. The classes are relaxed and Georgie offers guidance and structure but also allows for freedom of expression and if people want to experiment or do it their way, they're more then welcome! I highly recommend Georgie's class. The class is a great introduction to texture and Georgie's approach is very encouraging and relaxed. I look forward to booking another class again soon. I have attended two of Georgie's Saturday classes. I'm new to painting and it was the perfect introductory class for me. 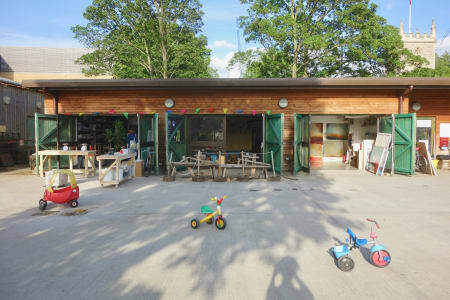 The studio is easy to find in in a city farm with a lovely food market just outside the door. Georgie is friendly, interesting and easy to talk to. I enjoyed the conversation as much as the art! The atmosphere is relaxed. She lets you do your own thing and encourages you to find your own style but she is also very happy to share her own expertise and knowledge if you have any questions, need some inspiration or are feeling a bit stuck with a piece! I'll definitely be back. I very much enjoyed Georgie's class as she was engaging, patient and informative. It was great to hear about and try out her unique approach to landscapes - I would definitely recommend! Georgie’s class was a really fun experience! I met some lovely people who are now friends. The classes were relaxed but informative and Georgie talked us through some different textures and techniques that she uses in her own art whilst encouraging us to branch off and experiment with any of the materials provided. All in all a fun and well-structured course that brightens up a Monday evening! I found that the Landscape Painting and Texture course helped further my interest in texture and layer making. I loved learning new and unusual techniques which helped to create more depth in my work. The class was fun and free-flowing and as it was a small group, it was easy to ask questions and get feedback. Highly recommend for any aspiring artists, or anyone that fancies taking few hours of their week for some therapeutic painting and to learn some thing new. Georgie was a really wonderful teacher and just being around her paintings was super inspiring. Would love to do another workshop when it comes up! This course was amazing, such a great atmosphere being on the farm and using the natural materials to create textures when painting. Georgie was so friendly and really informative! Had such a lovely time and meet so great people too, would 100% recommend this course. Thank you georgie! A really therapeutic evening spent in Georgie’s beautiful studios painting and exploring techniques. The atmosphere is very calming as it’s set on a farm and you’re surrounded by Georgie’s inspiring colourful artworks. Georgie helps you try out techniques and materials that you may have never used and shows you how to use them. The intimate group of 4 is just right as you can get the guidance you need and also meet new people! All in all, a very special find! I just loved going to these classes! What an inspirational setting, expert guidance from Georgie, and ample opportunities to create and paint! I was really in need of something to unwind in the evening and to rediscover a love of painting, bringing home several paintings at the end was a bonus! Highly recommend, whether you’ve painted before or not. Georgie is an amazing teacher. Really helpful and knowledgeable and she lets you learn at your own pace as you experiment with different techniques. She makes it easy for someone with very little skills to create beautiful works of art. I have just collected the painting I had framed after my fantastic sessions at 'Georgie's Saturdays'. I hadn't painted for years and this offered me the perfect solution to get back into it! Georgie is so inspiring, kind and patient and her enthusiasm is infectious. She gave me the confidence to just have a go and it's perfect being able to just turn up to a space set up for painting as it's hard to put space aside for that at home. Can't recommend it highly enough - a real therapy. Georgie’s class was small and intimate! I went on a Saturday and it’s maximum of two students. She is an inspiring artist and great teacher. Really great conversation and unlocking my artistic side. Would highly recommend! I recently had my first class with Georgie and thought it was fantastic. She is a great teacher and really encouraged me to be confident with my painting. I would highly recommmend her class and plan to go again! I really enjoyed Georgie's class, she is a great teacher and her studio is the perfect place to paint. Surrounded by lots of her beautiful paintings her studio in Stepney City Farm is a great venue to get inspired. I love Georgie's abstract style and her use of texture, so it was a great opportunity to learn her techniques. I will definitely be signing up for another class! I loved my painting session with Georgie. She is warm, friendly, helpful and inspiring. We had a good chat about ideas for my painting and she gave me lots of ideas that aided my own creativity (I may have never thought to add texture with polyfilla otherwise!). The studio itself is in a lovely setting overlooking the farm with pigs, goats and hens. There is a farmers market too with lots of tasty offerings. Definitely an experience to be repeated, very calming and hugely enjoyable! Great activity for a Saturday, I really enjoyed myself! Georgie is super helpful with showing you different painting techniques while letting you do your thing and be creative. Lots of different colours and canvasses to choose from. The venue (Stepney City Farm) is also really nice and has lots of animals, plants and a farmer's market. Having not even picked up a paintbrush since school Georgie was really patient, incredibly helpful and clearly knows her stuff. The class was genuinely great fun, very relaxed and there was even time for a tour of the farm. Would highly recommend and will be back! I had such a wonderful time. Georgie was really encouraging and got me out of my comfort zone. It was great to try new ways of painting the things I love! The session was held in Georgie's studio and it was very inspiring to be surrounded by her works. Thanks Georgie! !